Most of my compositions are written for smaller ensembles, but there is also music for orchestra or electronic music. For some years now, I have been applying myself to compositions for lute, theorbo and guitar very intensively, including pieces in different styles and music for tuition. 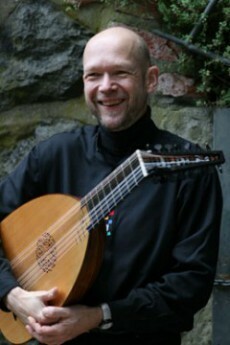 Among the plucking instruments, especially lute and theorbo have fascinating tonal properties. Considering the multifaceted music scene today, there is a chance for composers and players to break away from the cliché of a merely historical instrument. It would pave the way for contemporary lute and theorbo music and new developments in instrument making. For this, a special page on this website is Contemporary Lute Music. As a player of Lute, Theorbo, Guitar and Baroque Guitar, continuo and solo music of renaissance and baroque belongs to the repertory, as well as compositions of my own. From the tonal intermediate world, always on the threshold of the non-tangible. In addition to the special tuning of the bass choirs, many different percussive articulations and playing techniques are used as well as playing with slide. 7 sets, about 18 minutes. In this piece, rhythmics and tempo structures are a particular challenge for the players. To interpret the piece properly, the players have to find closest proximity despite the tonal diversity of the instruments. Premiere took place within the concert series “Sonorizzonte” April 30, 2017, 6 pm at Alte Hofkapelle der Münchner Residenz. Performed by Michael Freimuth, Laute and Arno Jochem, Viola da Gamba.